This isn’t a review of a horror novel, but the book is by Joe R. Lansdale. Because Mr. Lansdale’s newest novel, The Thicket, is doing so well in hardcover right now, I thought I’d talk about the author’s first western novel, The Magic Wagon. I was never much for westerns until I became acquainted with the works of Joe R. Lansdale. I mean I’d read some western novels by Edgar Rice Burroughs, Louis L’Amour and Larry McMurtry over the years, but my favorite genres were horror, thrillers, suspense, and crime noir. By the time I picked up The Magic Wagon by Mr. Lansdale, I’d already read five of his Hap/Leonard novels, along with The Bottoms and A Fine Dark Line. The style of writing and the East Texas sense of humor that the author displayed made me an addict for his books, especially his westerns. 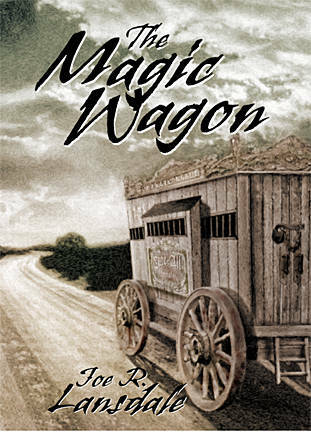 The Magic Wagon is the story of Buster Fogg, a fifteen-year-old boy who lost his parents in a Texas tornado in 1909. After the burial of his father (his mother was never found) and the local bank called in the marker on the family land. That’s when Buster decides it’s time to start making his own way in life and to never look back. With an injured leg and a pair of crutches, he sets out on foot for town one morning in the middle of winter, hobbling his way step by step over the icy road. By noon he’s tired and ready to call it quits when a red wagon, drawn by eight mules and driven by a big colored man, suddenly pulls up alongside of him. Old Albert, the driver, offers Buster a ride. At first the owner of the wagon, trick-shooting-artist Billy Bob Daniels (he claims to be the illegitimate son of Wild Bill Hickok and is perhaps the fastest man alive with a handgun), is against the kid coming along with them, but soon gives in begrudgingly to Albert’s wishes. And so begins Buster’s journey of adventure and to becoming a man as he travels from town to town on the Magic Wagon with Albert, Billy Bob, the dead body of Wild Bill Hickok, and Rot Toe, the Wrestling Chimpanzee. During a layover in the small town of Mud Creek, a gunfighter known as Texas Jack Wentworth challenges Billy Bob to a shootout. The outcome of that gun battle has a dire affect on Buster’s life and things will never quite be the same for him. The Magic Wagon is a perfect example of what great storytelling is all about. Though a short novel, it’s filled with memorable characters (both good and bad) that leave a lasting impression with the reader. There’s also tragedy and humor, both of which carry the reader through a gamut of raw emotions. Few scenes in a novel have affected me as strongly as the one where the tornado whips down onto Buster’s home without warning, ripping the barn apart, driving a pitchfork into the chest of his father, and carrying the farmhouse away with his mother still in it. If that’s not enough, there’s also adventure of the grandest sort. When Old Albert tells Buster about how they came across the body of Wild Bill and almost died in the process, the reader is drawn skillfully into the scene, becoming one with it and experiencing the fear and distrust as everything unfolds into a battle of life and death. Now, I don’t know if there were really pistoliers in the Old West that could shoot as good and fast as Billy Bob Daniels, but Mr. Lansdale definitely had me believing there was. I felt like a kid at a circus as Billy Bob shot small coins out of the air, split playing cards in half that were turned sideways, and fired a shot that drove a cork into a bottle, knocking out the bottom without shattering the neck. With The Magic Wagon, the author draws a clear portrait of how the West really was with its dirty, cow-dung smelling towns, the false myths of dime-novel heroes, and the suddenness of abject violence and death. Mr. Lansdale projected all of this with a style of writing that’s smooth, natural, alluring, and very down to earth, capturing the reader in a solid grip that even Rot Toe the Wrestling Chimpanzee couldn’t break. Stephen King once wrote “It’s the story, not the teller of the story, that’s most important.” Amen to that and to Joe R. Lansdale for writing some of the best damn stories out there. As a writer, Mr. Lansdale has been lucky in being to write exactly what he wants. This has certainly proven to be the right move. Every single short story, novella and novel is (or at least pretty close to being) a masterpiece. You won’t go wrong with a tale from Joe R. Lansdale and may very well find yourself addicted to his writing just like I am, as well as millions of others.